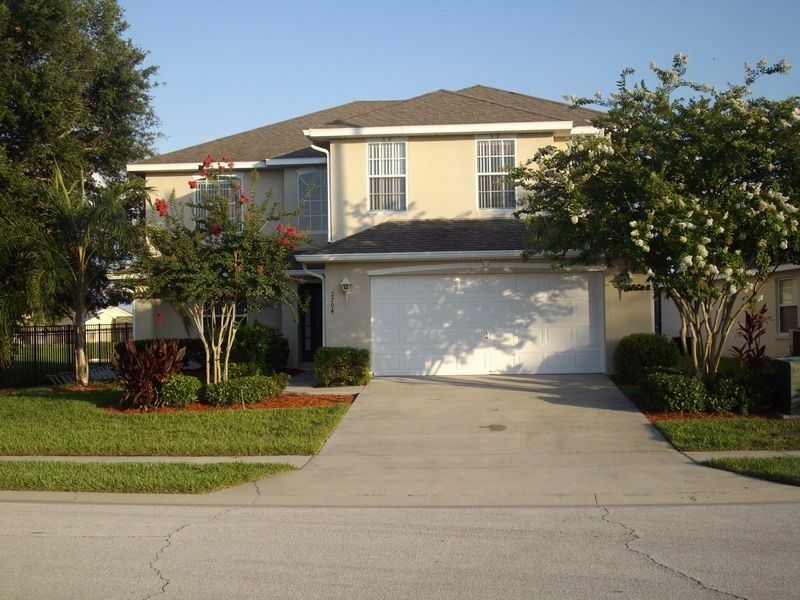 based on one of the finest communities in Kissimmee, and within walking distance to the Award winning Remington Golf course, this 5 bedroom villa has all the amenities to make your stay memorable. Quiet and peaceful, This house has it all. Take a dive in the heated south facing pool or a relaxing wine under the parasol, and gaze across the lake featured a the rear of the property. The kids (and adults!) will love the pool with the toys our guests are free to use and having the privacy of no immediate rear neighbors. Ideally located within 20 minutes from Disneyland but far enough away to enjoy beaches, shops and restaurants usually used by the locals The villa is family friendly with being based in a quiet neighborhood, adjacent park and monitored alarms including pool. The villa boasts a south facing pool for all day sunshine On the patio are seating arrangements with tables and parasol, and sun lounges. There is also a small very quiet park to the left for a quiet evening stroll or a little football. There is also a pool table and a playstation for our guests use. The main bedroom carpets, stairs and landing have been replaced which look and feel great. Broadband wire-less internet is now available to our guests,television in all 5 bedrooms rooms all with cable, dvd players to 3 of the bedrooms and one in the lounge.Separate laundry room with dryer.Main bedroom has a king sized bed with large ensuite with oversized shower and tub . Bedrooms 2 and 3 have single beds very tastefully decorated for children. Bedroom 4 has double sized bed with ensuite. Bedroom 5 has queen sized bed .Upstairs there is family bathroom.Downstairs boasts tv room/dining area/and 2nd seating area.Modern kitchen with all utensils/cutlery and all necessary pots and pans needed.There is also downstairs w/c with wash hand basin.Tv room has dvd player and playstation 2 with games.Rear of the property overlooks a large waterfront and has a heated swimming pool with screen enclosure. This is a separate unit based in the laundry room. Access is through the sliding double doors and leads to the patio. There is two tables with parasols and seating for 8. Also 2 sunloungers. Excellent house, fantastic pool view and ideally located for theme parks. Just 5 mins from turnpike then 20 mins to Universal and International Drive. We had a great time, the home is spacious and in a great location. Turnpike only minutes away and international drive/seaworld 20 minutes. St cloud is a great town and the marina is relaxing and only minutes away. House was awesome and well looked after. Close to all amenities. Only thing I would mention is that the house is located in a flight path of low flying planes. Not really noticable inside the house though. Well thank you for taking the time to review your stay. We are very happy the home made your stay comfortable. This home was so beautiful and so clean, my family and I were in complete shock when we walked in. We have stayed at many house in "HomeAway" but nothing like this one. All the rooms were super neat, the kitchen was impeccable. Also a very nice feature is that the back screen door has an alarm that turns on if the door is left open, I thought that was great because we traveled with children and there was a pool. The owner was super attended to us, every time I emailed him a question or concern he would write back to me really fast.. only minor problem was that we couldn't control the air and it was pretty hot at night it was automatic set at 76 and it stayed there the whole time really uncomfortable to sleep in hot weather when one is not use to it plus it's Florida. But overall it was a real great experience that's why I give it a 5 star. Thank you for your taking the time to review your stay at our villa. We are really happy you enjoyed your stay. Our management have looked into the heating controls and have amended the handbook. This house was very clean, comfortable, and spacious. The house had everything we needed to function as a home away from home. Communication was great; all question were replied to immediately. The home's location is near grocery stores, places to eat, and retail shopping. I would defiantly stay at this home again. Thank you so much for helping to make my family vacation wonderful ! We really appreciate the time to review our property and your stay. Happy you found everything to your liking and your stay was enjoyable.